German philologist; born at Frankfort-on-the-Main May 21, 1829; died there Aug. 29, 1870. His father was Solomon Michael Geiger, the eldest brother of Abraham Geiger. Eliezer Geiger began the study of Hebrew at a very early age, under the guidance of his father. Not originally devoted to a literary career, he spent several years as a bookseller's apprentice at Mayence, but soon showed a great dislike for business life. His thirst for knowledge overcame all obstacles. He returned to Frankfort, graduated from the gymnasium, and then went to the universities of Marburg, Heidelberg, and Bonn to study classical philology. In 1851 he took up his permanent abode in his native town, and devoted himself principally to linguistic and philosophic studies. His first publication bears the title "Ueber Umfang und Quelle der Erfahrungsfreien Erkenntniss" (Frankfort-on-the-Main, 1865). But as early as 1852 he had begun his chief work, to which his whole life was devoted: "Ursprung und Entwickelung der Menschlichen Sprache und Vernunft" (vol. i. Stuttgart, 1868). 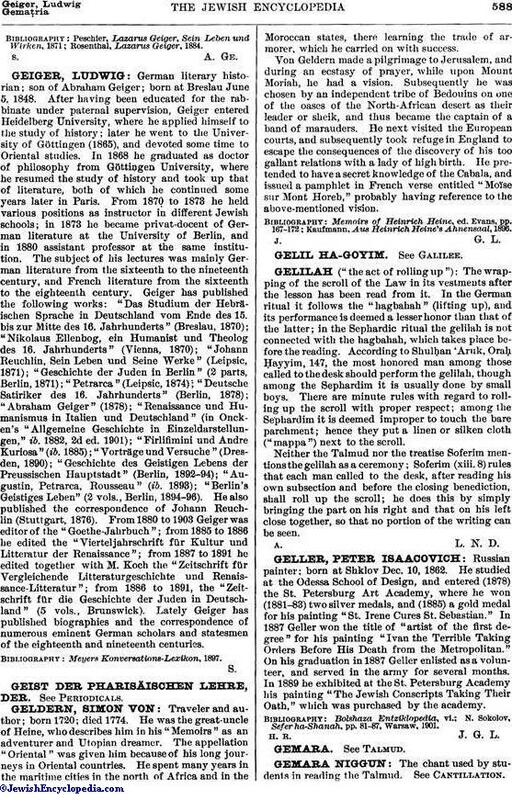 Geiger commenced to publish the principal results of his studies in the more popularly written "Der Ursprung der Sprache" (Stuttgart, 1869, 2d ed. 1878). Before he was able to finish his great work, however, a suddenly developed affection of the heart ended his life. The second volume was published in a fragmentary condition by his brother Alfred Geiger (ib. 1872; 2d ed., 1899). The papers he had read on different occasions were also published by Alfred Geiger under the title "Zur Entwickelungsgeschichte der Menschheit" (ib. 1871; 2d ed., 1878), and were translated into English by D. Asher ("History of the Development of the Human Race," London, 1880). 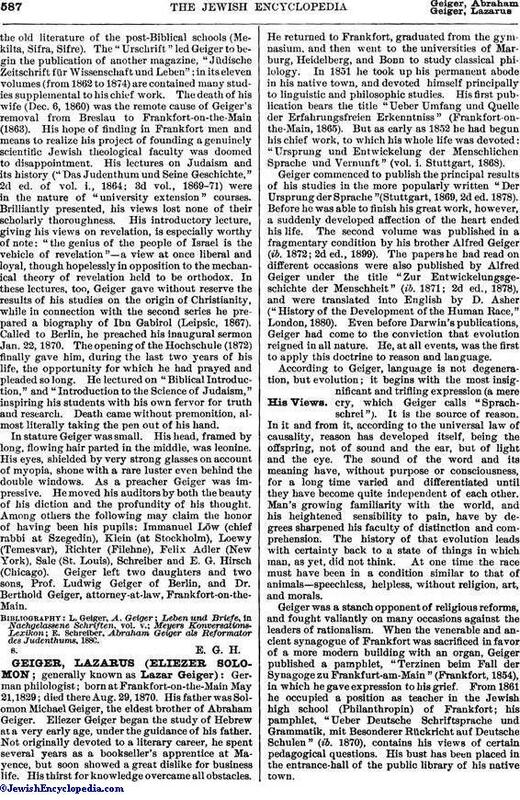 Even before Darwin's publications, Geiger had come to the conviction that evolution reigned in all nature. He, at all events, was the first to apply this doctrine to reason and language. According to Geiger, language is not degeneration, but evolution; it begins with the most insignificant and trifling expression (a mere cry, which Geiger calls "Sprachschrei"). It is the source of reason. In it and from it, according to the universal law of causality, reason has developed itself, being the offspring, not of sound and the ear, but of light and the eye. The sound of the word and its meaning have, without purpose or consciousness, for a long time varied and differentiated until they have become quite independent of each other. Man's growing familiarity with the world, and his heightened sensibility to pain, have by degrees sharpened his faculty of distinction and comprehension. The history of that evolution leads with certainty back to a state of things in which man, as yet, did not think. At one time the race must have been in a condition similar to that of animals—speechless, helpless, without religion, art, and morals. Geiger was a stanch opponent of religious reforms, and fought valiantly on many occasions against the leaders of rationalism. When the venerable and ancient synagogue of Frankfort was sacrificed in favor of a more modern building with an organ, Geiger published a pamphlet, "Terzinen beim Fall der Synagoge zu Frankfurt-am-Main" (Frankfort, 1854), in which he gave expression to his grief. From 1861 he occupied a position as teacher in the Jewish high school (Philanthropin) of Frankfort; his pamphlet, "Ueber Deutsche Schriftsprache und Grammatik, mit Besonderer Rückricht auf Deutsche Schulen" (ib. 1870), contains his views of certain pedagogical questions. His bust has been placed in the entrance-hall of the public library of his native town.